The University of Michigan’s Central Campus, located along South State Street, includes historic halls, the Museum of Art, the Graduate Library, the president’s residence and the famous Diag—an open area known as the busiest site on campus, hosting concerts, ceremonies, fundraisers and demonstrations. The Central Campus is the gathering spot for students and visitors, but it also is a gathering location for storm water in the downtown Ann Arbor area, particularly during large storm events. The university, along with the project engineer—CDM Smith-Detroit—devised a long-term storm water management plan to correct flooding and damage occurring within the buildings located at the Central Campus. The new Central Campus storm water system follows other storm water-management initiatives that the University of Michigan has implemented to benefit the entire campus and the community, including rain gardens, green roofs, porous surfaces, and infiltration or holding basins. 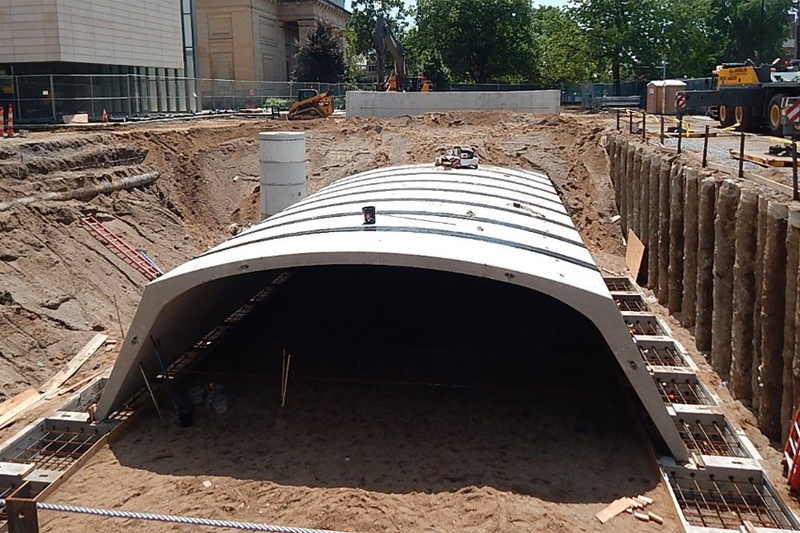 The new underground storm water infiltration system was designed to protect the campus from a 100-year, 24-hour storm event while providing additional capacity to the storm water systems of the university and the city of Ann Arbor. The new system also provides water quality improvements by removing sediment and nutrients that ultimately would flow into the Huron River Watershed. The project was challenging in several ways. The first challenge was designing a system to manage the 750,000 gal of storage needed during the largest storm water events while providing a large bed to allow natural infiltration. The second was developing this large underground basin in the limited space at Central Campus without damaging the existing building and infrastructure. An Armorflex articulating concrete block—an engineered erosion control concrete mat system to manage 10-ft-per-second high-velocity flows into the infiltration system. Storm water runoff is first treated using the CDS, a hydrodynamic separator that uses swirl concentration and continuous deflective separation to screen, separate and trap trash, debris, sediment and hydrocarbons from storm water runoff. Pretreating the runoff reduces loading and maintenance of downstream structures. Treated water then flows to the Con/Span underground infiltration system. Con/Span is a modular, precast, three-sided concrete arch system designed to provide economical, large-volume storm water detention or infiltration below grade. Its distinctive arch top and vertical sidewalls maximize storage volume while providing enhanced structural integrity. The open bottom of the system allows the collected runoff to infiltrate into the ground. The Armorflex materials were placed within the Con/Span to minimize the scour of storm water entering into the structure during the highest events. The Con/Span units were placed on Express foundations, a foundation system that combines the speed of precast with the economy of cast-in-place construction. Contech was able to reduce the size of the foundations to allow for onsite excavators to lift and place the foundation pieces without requiring a crane. This reduced the onsite use of a crane by one week and resulted in significant cost savings. The Con/Span system offered many benefits to the engineers and contractors. The access from State Street severely limited the size of the crane that could be used during installation. The use of the lightweight system was able to meet the size and weight limitations of the crane. The entire project was constructed on a tight schedule, as it was required to be completed within a 10-week time period while not interfering with the nationally renowned annual Ann Arbor Art Fair and prior to the 2018 school year. Contech engineers worked closely with CDM Smith and the university throughout the design and construction process, providing design, review, onsite technical assistance and specifications support.